(TibetanReview.net, Mar19’19) – The Central Tibetan Administration (CTA) at Dharamsala has on Mar 18 invited all Tibetans to make a token contribution towards a Tenshug ceremony for His Holiness the Dalai Lama to be held mid-May. 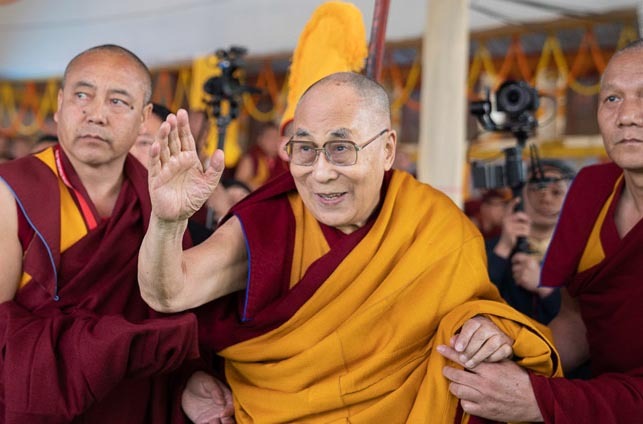 This is an obstacle year for the 84-year-old spiritual leader of Tibet and the ceremony is seen as being particularly important for this reason. The ceremony will symbolise the fervent prayers and devotion of both the people and the protector oracles of Tibet, said the CTA on its Tibet.net website Mar 18. Tibetans are invited to contribute an amount of 5.25 in the currency of their host countries through their concerned Settlement offices and Offices of Tibet abroad. In Dec 2018 the CTA made what has been described as a grand preliminary Tenshug offering to His Holiness in Bodh Gaya.